Photo from the Burton Historical Collection. 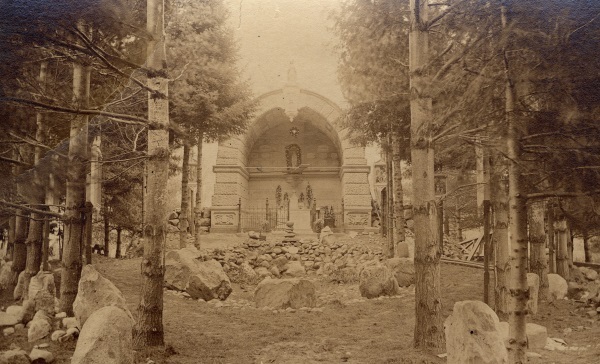 Date unknown, but the grotto appears to be under construction. 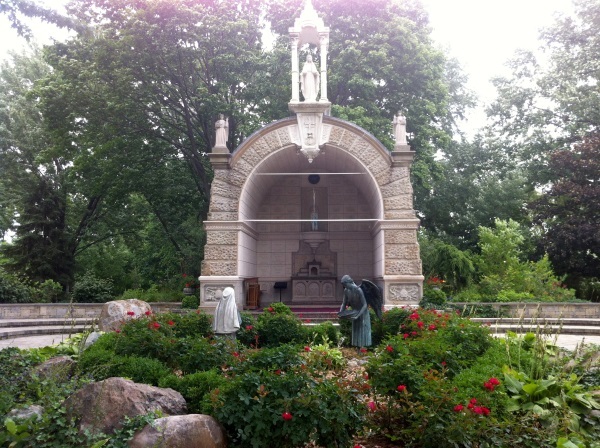 Assumption Grotto, 2013. Fewer piles of stones everywhere. In 1832, hoping to avoid the scourge of cholera, a group of German immigrants packed it out of town and started an isolated settlement in the wilderness. For a church, they built a log cabin and called it kirchen wald — church in the woods. That wilderness is now 7 Mile McNichols and Gratiot, and that log cabin is an imposing neo-Gothic cathedral called Assumption Grotto (13770 Gratiot Ave.), named for the once-famous shrine in its shaded graveyard. 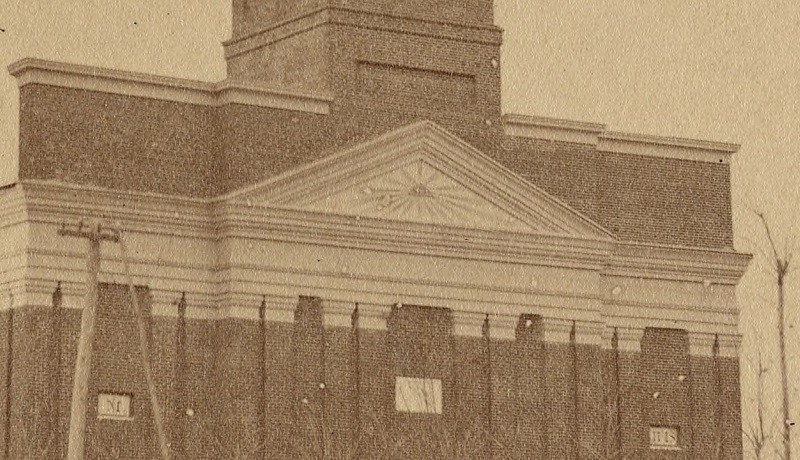 Photo from the Burton Historical Collection, 1882. This church burned beyond repair in 1907. Worshipers were at mass when the roof caught fire; no one noticed until two chandeliers crashed to the aisle below. This is all nice-to-know. You need to know about this Grotto. Father Amandus Vandendriessche was a Belgian who came to Detroit around 1851. He was an itinerant priest, boarding with his congregants at Kirchen Wald and riding through the woods to minister to a few other country parishes. 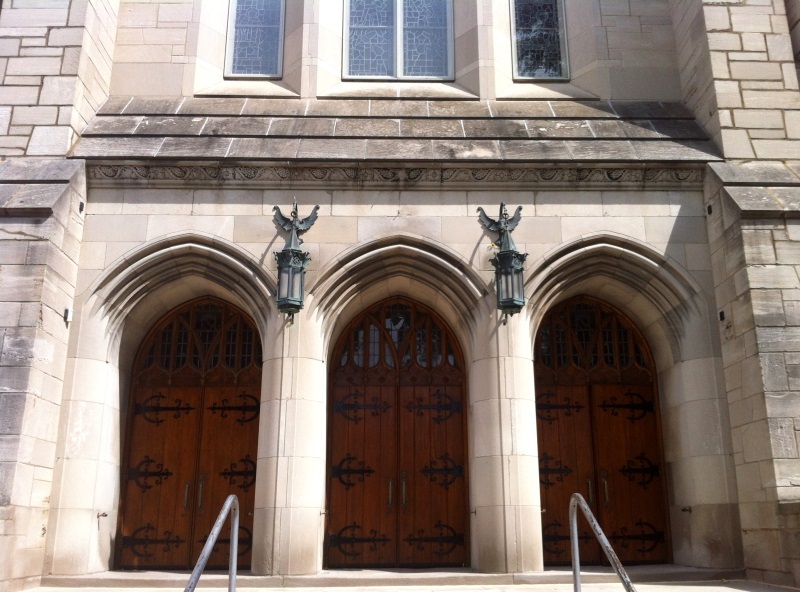 Under Father Van, the congregation built its permanent home and grew its flock. As the story goes, Father Van was inspired by an 1876 visit to the Sanctuary of Our Lady of Lourdes in France, and upon his return decided to build his own holy grotto in Detroit. 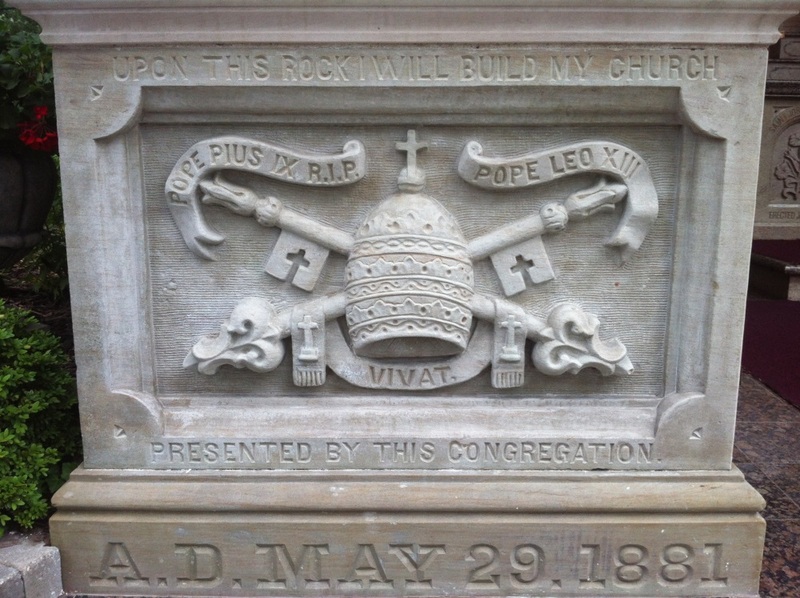 He laid the cornerstone in 1881. 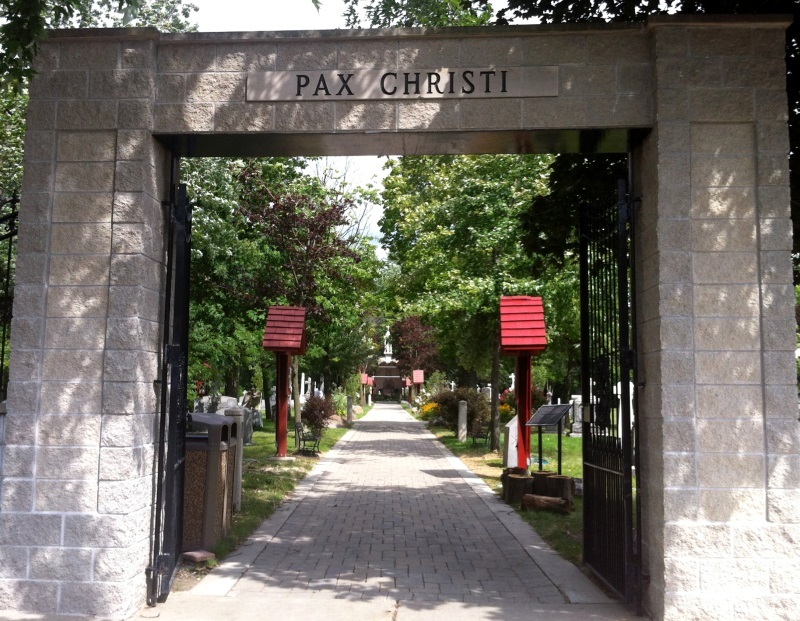 Designed by architect Peter Dederichs, the Grotto is approached by a 900-foot-long tree-lined walk through the graveyard. There’s a statue of the Virgin Mary on the roof designed to be seen from a distance and, in front of the grotto, a fountain. The water supply, reported the Free Press in 1881, was to be mixed with water imported from Lourdes. A more peaceful or retired spot could hardly be imagined, and yet this little country churchyard only a few years ago was the objective point of thousands of pilgrims who came from the city in throngs to worship at the shrine of the Blessed Virgin Mary located there. Here at the far-famed Grotto, which gave the church its popular appellation, hundreds of those sick in body, mind and soul have invoked the aid of the Blessed Virgin and found relief from physical pain and mental suffering. The cemetery itself is filled with tombstones in German, French, and English, some Rivards and some Schoenherrs, some people born in England, in Ireland, in Scotland. 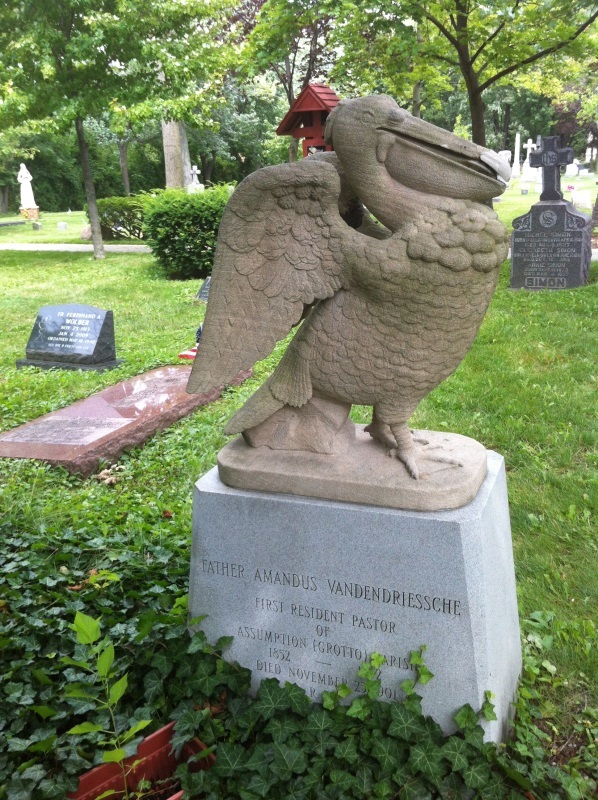 Grave of Father Amandus Vandendriessche, d. 1901. Here lies Father Vandendriessche, first resident pastor of Assumption and the man behind the Grotto. The pelican symbolizes charity and self-giving. 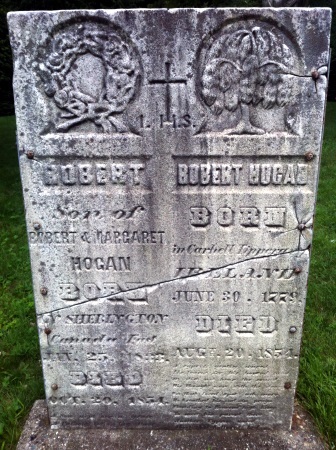 Grave of Robert & Robert Hogan, father & son, d. 1854. 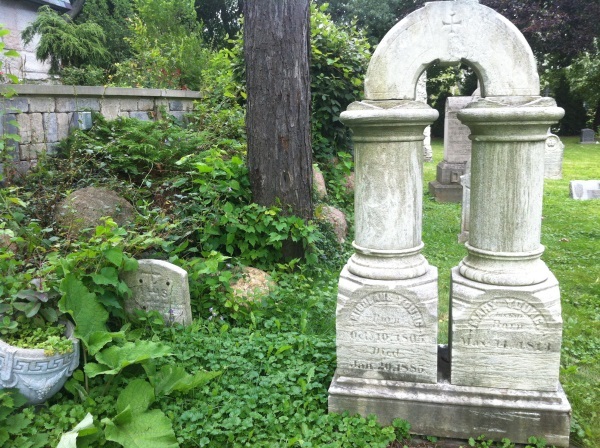 The oldest tombstones I could find, on the south side of the cemetery away from the main walk, dated from the late 1840s and early 1850s. Grave of Nicolaus Young, d. 1885. Is there a word for graves that are never filled by those who reserved them? Here’s Nicolaus Young, who died in 1885. Though the arch design is elegant, his wife Mary Young, b. 1813, is not here. Unless she’s alive and well at 200, she’s buried somewhere else. But where? And why? 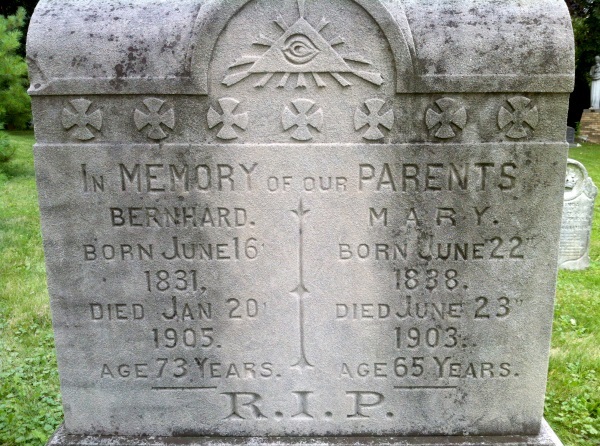 Grave of Bernhard Decker, 1831-1905, and Mary Decker, 1838-1903. I love this place. I’m glad it’s here. 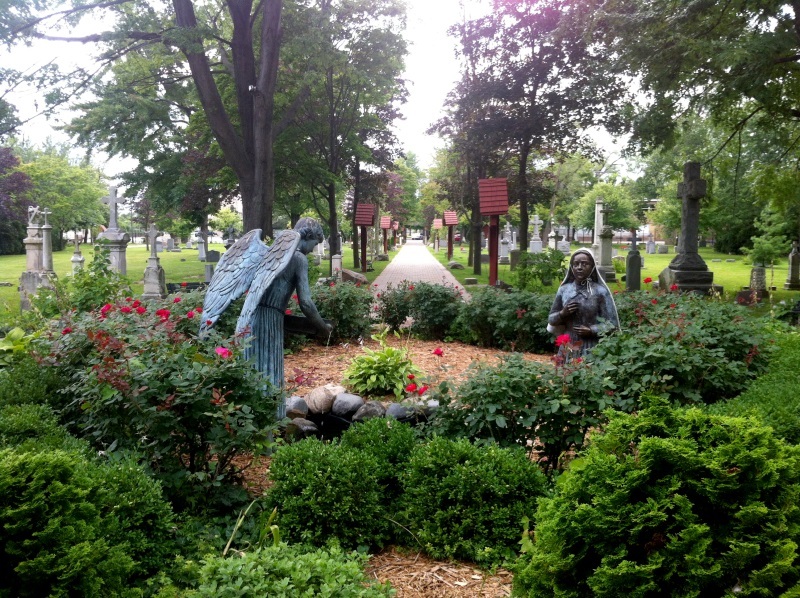 I visited this cemetery as part of my quest to visit every cemetery in Detroit. Wonderful, rich post. 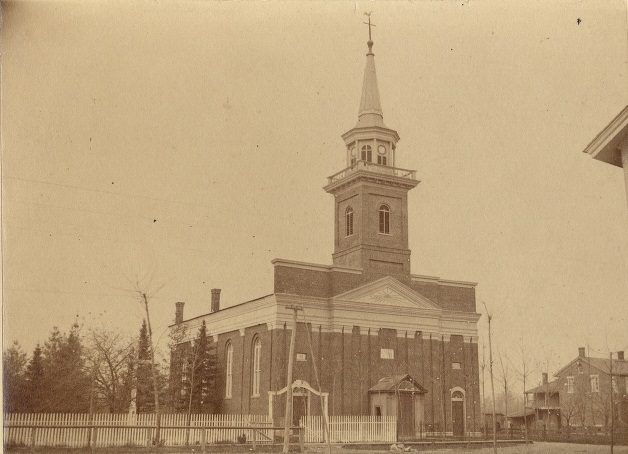 The Lourdes veneration was relatively new at the time the shrine was built in Detroit. The apparition in Lourdes dates to 1858 & the Pope approved this Marian veneration in 1862. I love that the priest had come to Detroit prior to those dates, but returned to Europe & then back to Detroit. The transnationality is striking. Great photos and musing regarding the tombstones. Nice writeup. Got a miracle here in 2001 (http://www.allyeargear.com/2001/2001-iditasport-extreme-350-pushing-it-to-the-limit/) but I visited late and it was dark. It looks much more beautiful in your photos. Actually, Assumption Grotto is closer to Six Mile; it’s just a couple blocks north of McNichols/Seymour (aka 6 Mile). Oh my gosh, that’s amazing! Ron, I’m glad you found the post. This is great historical context, Deborah – I had no idea. Fascinating! Oh gosh, you’re right. Will fix. I believe it’s called a cenotaph when there’s a grave marker but no body present. I’ve had this blog bookmarked for ages, and just came back today for a long over due visit, and what do I find??? This is my parish! It is indeed very beautiful, all times of the year. The Feast of the Assumption in August is our big parish event, and is still extremely well attended by pilgrims from all over, and is a great day of holiness for our entire parish. I’m sure she’ll be here shortly (I posted your blog post on Facebook), but here is the blog for our parish photographer, Diane, so you can see zillions more photos of our parish, and many of the interior of the church. I would SO love to see interior photos of the previous church that burned. Do any exist? Thanks, Liza for pointing me to this wonderful post on Assumption Grotto. Many more photos can be found at my blog, and at the photo site linked in my sidebar. I just visited the grotto today to see my ancestors. I’m sorry Ron Robinson, but unless you are related to me, Nicholas Young is my great great grandfather on my mothers side of the family! Sometimes a missing date of death does not necessarily mean that there is no one interred. In this case it might mean that the widow outlived many of the people who would have been responsible for having the stone revised — which also cost money. Why bother updating a headstone that no one will ever visit anyway? Heirs are not always full of love and concern. It’s also possible that when the husband died the wife had every intention of eventually being buried there, but after a while re-married and changed her plans. Atlanta INtown paper. Write monthly history column. Atlanta’s Cyclorama is one of my favorite research topics. Have published for 20 years. What information does Detroit Historical Society have on first performance of Battle of Atlanta. Also on staff of the Atlanta History Center and the Margaret Mitchell House. Attended Assumption GRotto School as well as my 7 children. So many memories!!! My parents are buried there (Theodore & Cynthia O’Connor) A wonderful place to grow up. THANKS !!!!! St. mary’s of Redford also had a Belgian pastor in it’s early early years. There were some Belgian families in Redford Township, best documented were the Magnees, also members of St. Mary’s of Redford. Wonder what the tie in was for Belgians coming to Detroit? Also St. Mary’s had a sigficant number of Swiss French immigrants that settled along the Greefield/Redford Township border. Many buried in the two parish cemeteries moved in 1924, mostly to Holy Selpulchre. I went with my grandma to Assumption Grotto when I was a little girl. This was her church, and I would have to get up at 6am to go to mass with her every Sunday. It was mostly in Latin back then, and I really didn’t understand what was going on, even when it was in English. Now she and my grandpa are buried behind the church, I don’t visit much anymore because the neighborhood isn’t too safe. I do try to go to the Assumption feast, more people milling around and the grounds and inside of the church are beautiful.